I am replacing an old electric Ingraham model 17 motor. The new motor will need to attach to the glass face of the clock which is 1/16" thick. There is a glass crystal about 14" in diameter and almost 1-1/4" deep covering the face. What size motor should I use? For a 1/16” thick clock face, I would suggest the MVT7130A, which is available in both battery and electric. If your clock hands are over 6”, then I would consider one of our high torque movements like the MVT708CHT Which is also available as battery or electric. I want to purchase a standard c size Quartz pendulum motor, but don't know which shaft to use. My present motor has a 3/8" diameter shaft and 5/16" long threaded section. I also want the gold hands 31/8" long. Please help. These AA movements have a 5/16” diameter shaft. I am looking for a replacement motor (or repair of mine) for a SANGAMO motor for my Seth Thomas clock. Don’t know the model of the clock but picture attached. My motor’s center bushing/bearing is warn allowing the shaft to wobble and make noise. Also, the wires connections are poor with one broken off. What are the names of the melodies for the quad chimes? I am looking for a 3 inch time piece that runs backwards. It needs to be very thin. I am attempting a project and as much as I look for this item, it seems difficult to find right size. I would love to purchase a very thin Antique/ivory thin metal clock with hands that run backwards as well as Arabic numbers on backwards close to 3 inches or not much larger then 3 inches. Our smallest reverse dial is 6". You could take it to a store like Staples and have it reduced to a smaller size and printed out on a heavy paper. Will the PD200 work with MVTRC15NP, Our pendulum weighs 3.5oz and is 20" long? A neighbor asked I look at her jahresuhrenfabrik 49 400 day clock. the weight is disconnected from the mechanism. it has the slid with a rounded fork on the end. I removed the sleeve and can see a brass wire that is flush with the end of the tube. did this originally have a cross member that slipped into the weight? I have no way to cross reference exactly what you have. We also only work with battery and electric movements so we are not qualified to advise you. The maximum weight for these American made mini pendulum movements is 2-1/2 ounces. The closer you get to the maximum the more important leveling is (or being vertically plumb). I am looking for a double A battery movement for a novelty alarm clock with mechanical bells on top. Here is the info on the movement CT678 CONTIN. It has a sweep second hand and a hand to set the alarm. We stopped stocking alarm movements about 5 years ago. Unfortunately, control switch locations are not standardized at all, so finding replacements can really be difficult. I’m looking for a battery operated clock kit that I can install on a plastic housing. The problem is the face is ~4” from the back where I would mount the battery mechanism. The longest shaft length you can get a quartz movement in is 1-1/4” long. It’s an engineering limitation. I’m building an art piece that uses a clock movement to rotate a large sheet of paper. I’ve tried a few DIY clock repair movements (including a high torque) and they don’t have enough torque. I really I’d use the second hand and minute hand so it rotates faster, or find a movement that can be sped up. Do you have anything that might work for me? I don’t really know enough about clock movements to look further than I have already. Our high torque quartz continuous sweep movements have a balanced maximum weight for the second hand of 7 grams and 18 grams for the minute hand. You would probably have to use hard wired electric movement rated for use with 3 or 4 foot hands, depending on what your torque requirement is. This is beyond the capabilities of the quartz movements we offer. I am trying to replace a clock movement on a very expensive boat clock. It is a Chelsea clock Newport Model (I believe). It is 2.1/8" Square. Overall Shaft length is 7/16" AND SHAFT LENGTH IS 3/16". However the shaft does not have threads, but the end of the overall length has a nut and threads on the end. I have photos to help locate it. What size replacement kit should i purchase for my wall clock which is 38"x48" long? You need a high torque movement. Our high torque quartz movements are designed to operate up to an 18” minute hand. A mini quartz mvt- American. Question...on securing the minute hand, there are two nuts...one with a round head, the other normal shaped nut. Do you use both nuts somehow? or is the regular nut an extra? Yes, there is an extra nut. The open minute hand nut is for use with a second hand, and the closed minute hand nut is for use with no second hand. I have an old Antsonia clock, around 1892. And one of the springs clicks when winding and won't tighten up. I've had enough of winding it anyway, but I still want it on my mantle piece, looking great, but working efficiently without having to wind it. I was thinking of taking out the old movement, and storing it inside the clock in case I ever sell it, then I can take it back to original. Then put an auto battery movement in behind the scenes so it is an beautiful, effective and efficient clock without the hassle. I like the old hands and am keen to find a battery movement that will fit the original hands. Also, it would be great if the battery movement can do Winchester chimes. Do you know of such a movement? Matching a movement to a pair of hands requires you to have calipers or a micrometer to make some very accurate measurements. You will need to check the length of the hand shaft. Let me know any questions. I have a question about the pendulum. I am replacing a movement with your battery version. the pendulum is 2 inches from the back of the dial. is 2 inches a problem? It has a 7 ounce maximum capacity. Can easily be used as a separate pendulum drive as I’m suggesting here. I am fixing an old clock that has very little clearance between the face of the clock and the glass. What is the lowest profile motor/mechanism that you carry? It depends on what size hands you need. The MVT0560 has a total shaft height of 1/4", but the hands we have availablefor it are under 2". The MVT7130A has a total shaft height of 17/32", and includes a choice of 45 pairs of hour and minute hands under 5". I need to find a replacement insert clock that would fit a 2-1/8" hole, total width across face and bezel of 2-1/2". I would prefer the bezel to be black. Do you offer this size and I am not seeing it on the website? The closest size we have to what you are looking for is our 2-1/4" F59 series, which fits into a 2-1/8" mounting hole size. I have an old wooden round mantel clock. I want to put an quartz insert into the opening. The hole diameter is 4 3/8", the outside of the clock is 5 3/8". Do you offer something to make this work? I need to replace the Takane clock that was mounted in my golf cart. The back snaps into the dash and is approx. 3 5/64ths in diameter. Can you help? Please advise what the diameter of the mounting hole size is. It’s smaller than the diameter of the front of the clock, but actually the most important measurement. Do you have a clock insert with a brushed gold or spun gold face with a mounting hole of about 2 1/8”, 2 ¼”, 2 3/8” ? Our F59 series has a brushed gold roman or Arabic option. Overall size 2-1/4”, 2-1/8” mounting hole size. We purchased a F108WAC 108 MM White arabic 4 1/4" clock insert. The clock insert is just a little small and won't stay in the clock frame. Do you have something we can use to fill the space? Try taking the gasket off of the back of the insert clock. Wrap something like electrical or plumbers tape around the back of the insert. Then re-install the gasket. Can be a bit of trial and error, but it normally works for small adjustments. Rubber bands can also work. I recently had my grandfather clock converted to a quartz movement. The pendulum set is only 16in with a small pendulum bob. It is on a AA battery by itself. Will the 25 in rod and 3in bob operate on a single AA unit? Our AA battery powered mini pendulum movements do not have enough power to operate a 25” pendulum. You would need to use our PD200 to operate a pendulum of this size. The PD200 will operate a pendulum up to 7 ounces, and the PHDPD will operate a pendulum up to 10 ounces. Make sure you know the weight of your pendulum before ordering anything. Being level or vertically plumb is very important for any pendulum drive. It’s important that the magnet and electro magnet on any pendulum drive also be as close as possible without touching. How difficult is it to install a quartz movement? It is surprisingly simple. Just drill a 3/8" hole in front of your clock case, slide the movement shaft through the hole and secure in place by tightening 1 hex nut. Do I need to use a second hand? Most quarts movements have the ability to run a second hand. It is your choice to use one or not. If you feel the step second motion would be a distraction then don't use one. A special closed nut is available to cover the small hole showing when a second hand is not used. Should I use a pre-assembled "fit-up" or a quartz movement with separate hands and dial? 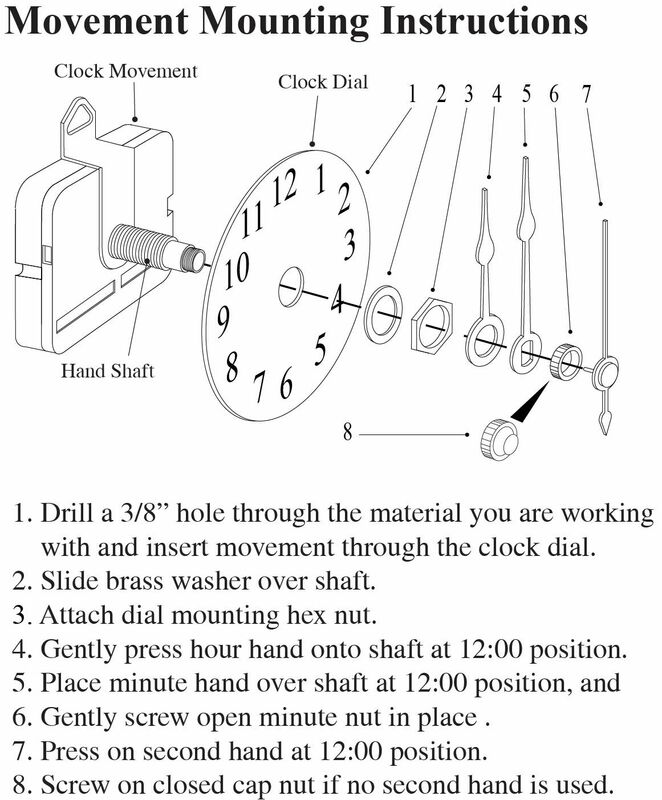 Using a pre-assembled quartz clock fit-up is the easiest way to make a clock. The clock movement, hands, dial, lens and Bezel are pre-assembled and ready to be installed. All you have to do is make a clock case with the correct size hole cut into it. Just set the time, put in a battery and press into the precut hole in your clock case. To use a quartz movement requires a little more planning, but is still fairly easy to do. If you choose to do this you have the flexibility of being able to se a standard time only movement, a pendulum movement, a chime movement or a variety of other possibilities. You can also choose from dozens of clock dials and over 40 styles of clock hands. If you decide to use a quartz movement with separate hands and dial, it is much easier to create a design that is truly unique. Do I need any special tools to install a quartz clock movement? No, you do not. All you really need is a well lighted work area and a small pair of pliers. Can I replace a battery operated movement in a broken clock I have? Yes you can, and it is not to difficult. The first step is to remove the old movement from your clock. Remove the clock hands first by gently pulling them off. Sometimes the minute hand is held in place by a cap nut. Just unscrew it and continue to remove the hands. The movement itself is normally held in place by a hex nut on the hand shaft, or it can "snap in" which means it is being held in place by little plastic "fingers". Either unscrew the hex nut to remove or just pry away from the case until snaps free. The next step is to determine the size of the movement you have. The most important dimension is the shaft length. If your movement was held in place by a hex nut, then you need to measure the height of the threaded portion of the shaft that the hex nut was mounted to. This is referred to as the threaded shaft length.If your movement was a "snap in", then just measure the overall shaft length. Now that you know the critical dimension of your movement, look in the movement section of our web site to find a movement that suits your needs and budget. Please remember that the old hands from your movement may not fit the new movement. Hour and minute hands are included free with movements, so pick out a pair when you order. I need to replace or repair an electric "plug in" type of movement, can you help? We do not sell electric movements or parts for their repair. Please contact Empire Clock Co. at their web site "www.empireclock.com". I need to replace or repair a mechanical weight or spring driven movement, can you help? We do not sell mechanical movements or parts for their repair. Please contact Merritts at "www.merritts.com" or S. LaRose at "www.slarose.com". If I give you the brand and model number of my broken clock can you help me repair it? Probably not. We deal only in the latest battery operated quartz movements. While it may be possible to use one of our movements to repair your clock, we have no way of telling because we can not reference the brand and model number of your clock to determine what you may need. How do I know what shaft length to use? The shaft of the movement must be 1/16" to 1/8" longer than the thickness of the mounting surface. How do I know what clock hands to use? There are 2 elements to consider - style and size. The style you choose is a matter of personal taste. Generally, the more traditional clock designs use hands similar to those shown below. Contemporary or Novelty clocks tend to look better with plain looking hands that do not distract from the overall design. The size that you use is determined by the size of the clock dial or fare that you use. Most clock dials have a minute track that runs near the outside edge. The tip of the minute hand should be just above the minute track. If your clock dial does not have a minute track, then the minute hand should reach about halfway across the numbers or indicators. Remember, the most important thing is what looks good to you. It is your design, it should reflect your taste. What are the minimums required for custom clock dials? We can run as few as 100 pcs. when making dials for fit-ups and 250 pcs. when making custom metal or styrene dials. Lead times can vary from two to four weeks depending on our schedule and the type of dial you want. Contact a ClockParts.com sales representative for additional information. Do you sell large quantities on a wholesale basis? Yes, we do! We stock thousands of movements that are ready for immediate shipment. If you need 500 or 50,000 movements we can handle your needs. Are all fit-ups available for immediate delivery? We offer the best selection of fit-ups in the industry today. While some of our fit-ups are stocked pre-assembled, ready to go, many others are made to order. Making many of our fit-ups to order allows us to offer thousands of possible models with a lead time of one to two weeks. We think that offering the possibilities we do is worth the wait and so do most of our customers. Just contact one of our sales representatives to find out what is in stock and current production lead times.